WordPress plugins are numerous, but there are some among them which deserve a lot more words. UnderConstructionPage plugin belongs to this group. Every #website should start with the #under construction or #coming soon page, and the more you maintain it the final result will be better. To spare the time and move forward to a long list of further tasks, take advantage of the UnderConstructionPage (UCP) plugin. It is user-friendly, efficient, fast, and it offers attractive templates for different purposes. Every week surprises with a new template. Easily, you can customize landing, coming soon, and maintenance page in no time. Reliable Drag & drop builder makes it that simple. The fact that the content of your page is currently not available does not mean it was lost. On the contrary, it is just temporarily inaccessible. Show the visitors that you keep everything under control by creating and maintaining under construction page that will strengthen your position on the Internet. It would not be as functional as it is if it was overwhelmed with unnecessary features. They are not a part of the UCP plugin, and therefore you will need just a couple of minutes to build a page. Too many options may confuse you, and based on the experience, it was our choice to enable you what you really need. Speaking about features, the best advice is to compare UCP with similar plugins. Its features will stand out. For an amazing visual appearance of the page, you can choose among more than 650,000 quality images. If you do not have any idea how you want your page to look like, use one of more than 150 templates. You can adjust them with minimum effort in accordance with your will. Affiliate and traffic tracking is available on one click, and you can share tracked inbound links with the highest conversion rate on social media. If there is no need to build landing or coming soon page, you can lean on the UCP plugin to control the entire website or just a special part of it. Such flexibility is a huge advantage from the start on. Be sure to check different versions to find what the best choice for your needs is. In the case of any trouble, our professional and friendly support will be happy to respond in no time. So far so good but there is more. Instead of having several plugins and use them separately for some specific purposes, UCP just got upgraded with another existing plugin – MailOptin. We all know how important is to grow and engage visitors and convert them into subscribers. Newsletters provide information about new products, buying opportunities, new topics on the blog, etc. Every subscriber is a potential customer, but to grab their attention is a job to do. MailOptin has a highly developed strategy for automated follow-up emails. If the event triggered, it would attract new visitors. The best is that you can install MailOptin and use it as a part of the UCP plugin. This integration offers the users an opportunity to create all kind of forms and popups and add them to the UCP easily and simply. MailOptin has been designed to generate premium quality leads, increase signups and boost conversions. Instead of trying to answer hundreds of emails and wasting days and weeks, modernize your business and use the autoresponder, email marketing, and automation plugin that will engage visitors and potentially convert them into customers. 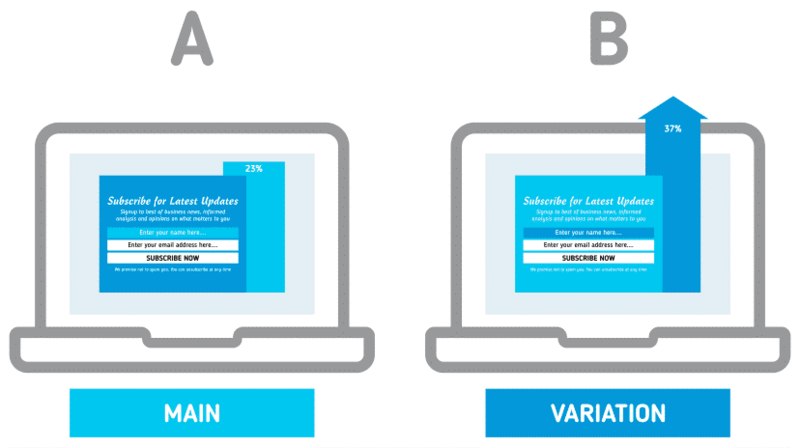 Newsletters have to be optimized to initialize call to action, but there are also other options for the same goal. Your website can be enriched with targeted messages and popups that are not too suggestive or let alone compromising regarding the visibility of the content. MailOptin offers you to create attractive and optimized forms and newsletters without investing a fortune in expensive software that will be everything but comprehensive. If you intend to grow and engage subscribers along with building the website, do not get stuck with hard to use tools. Nowadays, when you are obliged to GDPR, keep in mind that all MailOptin forms are already compliant and you do not have to think about it. What a relief! You already know how to use Drag & Drop Builder for creating templates in UCP. The same case here in creating optin forms and emails newsletters. It is a powerful tool you do not have to be a designer for. Your templates will be appealing and conversation optimized. Make it as you wish with the full control of the content. As simple as you can import MailOptin options to UCP, you can integrate it with all email marketing services as well. Optin forms differ. There is a variety among the lead generation that enables you to overlay it above the content to grab the attention of the visitors. Convert visitors into readers, and you are half a way of converting them into customers. Build an email list with Sidebar/Widget optin form and perform a call to action with targeted messages. There is a button for it. MailOptin Lite version offers you three forms which are quite enough to set the goal. After conversion, actions have been introduced through close optin forms and redirect to a custom page. Not every page has to be followed by email signups or popups. You create the strategy for specific posts and pages, and the plugin does the rest. Estimate where the content will perform the best results and display it with purpose. As soon as you upload a new post, you will need a notification. An automated email newsletter can be targeted or restricted to specific categories and tags. Not all users are the same. You can focus on all registered users or the smaller groups. They will be up-to-date, and you will keep in touch instantly. The dynamic is up to you, and it depends on the frequency of the published posts. Think about daily, weekly or monthly digests of published posts, and schedule them at any time after publication you find convenient. 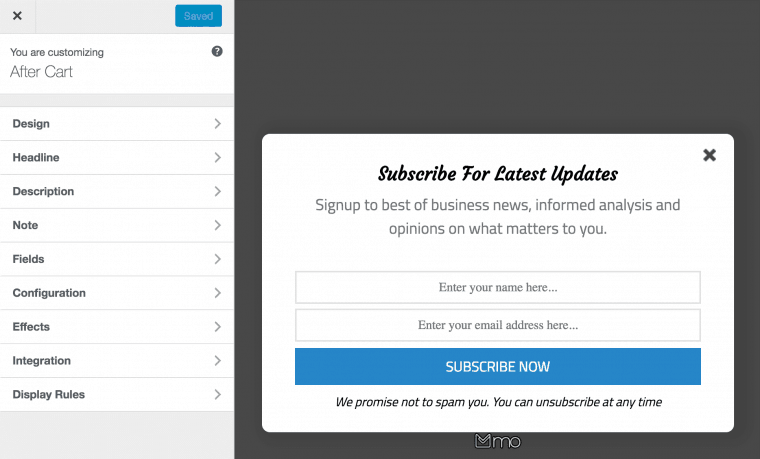 MailOptin Premium offers even more – event-triggered newsletters, for example. If you want to act like a marketer to get people to action, try A/B Content Testing to define the best optin campaign and find the most effective for the larger audience. One of the main features of MailOptin is the right timing. Continuous track of visitors’ interaction leads to a display of the right message at the right time when the chance of being converted is at the highest level. In this way, you avoid too early display before the potential subscription, or the too late in which case you lose a new lead. There are several triggers that arrange optin forms or message in just about the right time. Although most people think about using popups and optin forms when the website becomes active, the right time to use them begins far earlier. 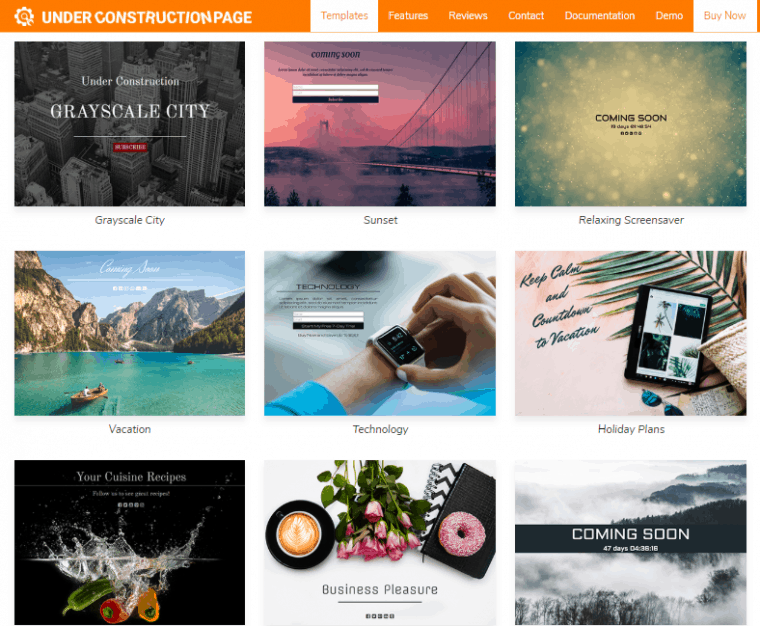 Your decision to create coming soon or under construction page with UCP plugin shows the goal to have a controlled, attractive, and intriguing page that will grab the attention of visitors at first sight. Do not miss the opportunity to attract them even more, and offer them to be the first who will get the notification about the new content or some special offer. You conquer a larger audience with every new visitor, and you shall continue this way. By implementing MailOptin plugin opportunities to a page created with UCP, you have built the firm ground for future success. The under construction or coming soon page will be professional as it might, and it will testify that you are a serious entrepreneur who does take care of every detail. Think outside the box, and make the first impression that will induce them looking forward to returning to the page over and over again. What is a Script Font? And Why Should I Use It? How Does IKEA Use E-Commerce In Its Marketing Strategy? Published on November 25, 2018 by Peter Hughes. Filed under: email form, popup.